Casual family restaurant with a relaxing atmosphere and a spectacular view to the lagoon from its outdoor terrace. 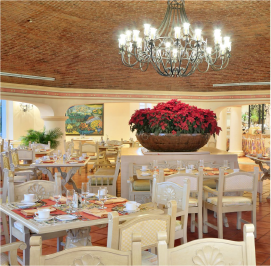 Breakfast and dinner are served either buffet or a la carte depending on the hotel's occupancy with a wide variety of Mexican, local and international dishes. Casual attire is allowed for dinner. No bathing suits are accepted. Open daily from 7:00 to 12:00 and from 18:00 to 23:00.